Dinosaur Ichnite Sites of the Iberian Peninsula has been part of the Tentative list of Spain. Whilst I was visiting the cave of Tito Bustillo in Ribadesella I took the opportunity to have a bit of a hike to see this potential World Heritage site. 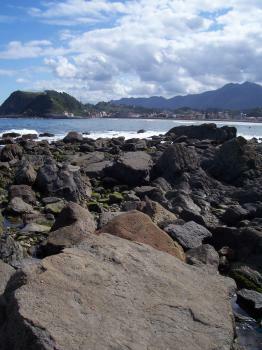 There are two Ichnite sites near to Ribadesella, one at then of the towns charming beach and another a few km's away up and over the cliff at Terenes. I visited both on a lovely September afternoon. However this was far from a wasted trip, I really enjoyed the climbs up and down the local cliffs and clambering all over the rocks on the shore. The surrounding landscape was very impressive, and I also managed to catch local hero Fernando Alonso winning a grand prix in a delightful bar at the top of the cliff at Terenes. I am not sure if these sites will be added in their present format, and I have no real knowledge of Dinosaur Ichnite to say whether they are worthwhile or not. However as a casual observer I could tell you if I had seen them or not, however the coastline and town on which they were situated was very pleasant and I greatly enjoyed my afternoon of Dinosaur hunting. The Dinosaur Ichnite Sites of the Iberian Peninsula has been put forward by Spain as a serial nomination of no less than 216 locations, of which 35 are 'selected sites'. The nomination has already been deferred before (in 2006), and by account of the IUCN evaluation of that time, it will get a hard time to be inscribed at all. They face strong competition from a footprint site in Bolivia, and a group of sites in South Korea (which are larger/longer/more diverse). Ichnology is the study of fossil tracks. There are a lot of these, way more than preserved fossil bones. When a trackway shows up, ichnologists take measurements such as the length of the stride and the width of the trackway. The footprints vary greatly in size, as they were made by smaller and larger animals, bipeds and quadrupeds. I visited the 'Jurassic Coast' in Asturias, a stretch of coast between Cape Torres and Ribadesella with a high density of ichnite fossils. It has a favourable location for the discovery of dinosaur tracks due to the great abundance of deposits from the Upper Jurassic era. The high rainfall in this region and the marine erosion (causing landslides) permit the discovery of new footprints as well as the destruction or burial of others in a relatively short period of time. The first discoveries here date from 1975. My first try at seeing them was at the beach of Tazones. I did find a sign here, pointing the way to the tracks, but didn't see any footprints. Probably they had disappeared under water because of the high tide, or they are located further along the cliffs. An easy way to get a feel for what you have to look out for can be found at the Jurassic Museum in Colunga, also in the same area. I did not find the museum as a whole particularly interesting (not if you've seen dinosaur skeletons before), but in the basement there's a good selection of local dinosaur footprints. They have been carved out of the rocks. Finally, I gave it another try to see them in situ. The Terenes cliffs near Ribadesella are one of the most prominent locations for the footprints. The site is signposted. It's all the way down a steep cliff, about one km's walk. There were even other tourists around (about 10! 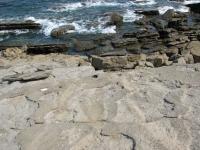 ), which fact reassured me that it's not that weird to go look for dinosaur tracks. There's a viewing platform from which you can see the former mudbed where the dinosaurs left their marks. I found it terribly hard to distinguish any specific print, they all looked like shapes made by erosion to me. A fascinating subject it is anyway. "develop a thorough global comparative analysis, .. and consider a serial nomination"